Teresa Tanzi: Just How Blue is RI??? Just How Blue is RI??? Let's show the rest of the country just how much we believe in theDemocratic Party and all it stands for this Tuesday, April 24th, by turning out to vote in the Presidential Preference Primary! Not only will you get to vote for Barack Obama, but you will also get to elect delegates to nominate him at the Democratic National Convention at the end of this summer! 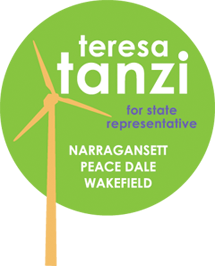 It is with great pride that I add my name, Teresa Tanzi, to this Tuesday's 2nd Congressional District ballot to be one of the delegates to represent Rhode Island in Charlotte, North Carolina. With your support, I hope to be there cheering our President and the Democratic Party to victory in November. I ask for your support this Tuesday to represent you at the convention, and to nominate our President, Barack Obama, for a second term. P.S.- Find your polling place here, don't forget your ID, and remember polls close earlier than usual!!! P.P.S.- You can vote for up to 11, but you only need to vote for who you want to... and my name is 13th on the ballot!! !